Top row, from left to right: Medill and Weinberg sophomore Avriana Allen, McCormick sophomore Nic Tan, McCormick sophomore Alvin Chen, Medill and Weinberg junior Elly Rivera. Bottom row, from left to right: Weinberg junior Vincent Park, McCormick junior Alexis Liu, McCormick sophomore Barry Zhang, McCormick sophomore Kareena Sharma. Photo By CatsWork. Logging onto Northwestern’s HandShake or receiving an email notification from LinkedIn can cause panic among some students. Thinking about internships or post-college plans is scary – where do you begin to network? How do you learn how to ace an interview? For students who don't have previous connections to companies, the time spent researching work opportunities in a field of interest, filling out applications and attending job fairs and recruiter visits can feel like a fifth class. But, a new website built and run by Northwestern students – and geared toward Northwestern students – might make the search for a career experience a bit less daunting. You’re not alone if your first thought after reading that was, “These students sure have a competitive edge on their resume in comparison to mine!” But its founders say CatsWork was built for us – not just their portfolios. Their website makes it so that Northwestern students can learn tips on boosting their resumes and critical networking and interviewing skills, in addition to gaining Northwestern-specific career advice. While other students went home to feast this past Thanksgiving, team leaders Vincent Park, a Weinberg junior studying economics and political science, Nick Tan, a McCormick sophomore studying mechanical engineering and the other members of the CatsWork team booked a suite at a hotel in the North Shore area for what Park defined as a “24-hour hackathon.” Tan described the scene as everyone “hacking away” at their computer keyboards. With Tan and Park repeatedly picking up food for team members throughout the 24-hour suite excursion, they had the fuel to finalize the Google Chrome extension essential to the CatsWork website. The Chrome extension helps consolidate essential networking information into a single Google Doc through our Northwestern Gmail accounts. It not only works for LinkedIn, but also for alumni networks and company websites. Just two clicks and boom – the information is on a document, along with all other contacts you’ve reached out to or will connect with later that day. Beyond the extension, CatsWork has a series of videos featuring Northwestern students and professors giving advice on interviews and applications for various industries. According to Park, the team is also currently working on securing interviews with recruiters. “What’s different about the product is that there are many resources online that help you with interviews, but what we uniquely have is that we try to extract Northwestern-specific information," Tan said. "You're learning from people who are in the same classes as you, the same clubs as you, so you're trying to learn how they used all the Northwestern-specific things to their advantage in the recruitment process." 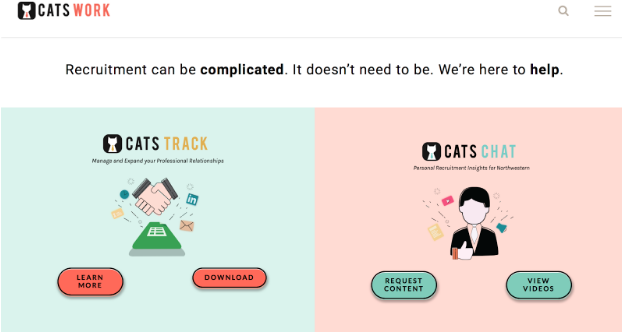 Although they do not yet have a forum, CatsWork has a page on their website curated with the best articles and tips from general career advice websites, Northwestern Handshake, LinkedIn and beyond. However, according to Park, they plan to implement an online anonymous forum for any and all questions. While Park does not yet have a career plan and Tan already has a job waiting for him when he graduates in two years, together they have a unique perspective on the job recruitment process at Northwestern. They’ve both watched friends (and each other) struggle with the balance of classes and career searching, making the two a dynamic mind behind CatsWork. At the moment, CatsWork’s videos focus on finance and consulting, since those are the two most popular fields that are going through recruitment this winter. But worry not marketing, science and history majors, as the CatsWork Chrome extension still works for everyone – and the team is creating more videos as I type!